LEGEND FEATURE: Angélique Kidjo honoured! 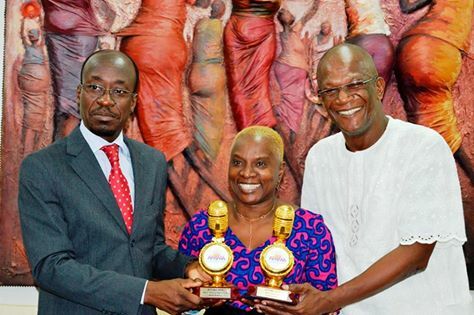 Angélique Kidjo was honoured with two trophies at the #AFRIMA2014 including one for best female artiste in West Africa. The event was held in Lagos last Saturday. Though she wasn’t able to make the trip to Lagos in person for the evening of the gala of the All Africa Music Awards ( afrima ), Bénin Cultures announced yesterday(29th December) that the legendary singer has officially received her trophies. The minister of culture, Jean – Michel Abimbola confirmed this to the press. The presentation took place at the ministry of culture in the early evening in the presence of others like Richmir Totah (who led the delegation in Lagos), the director of the aid fund to the culture and the director of the artistic and cultural promotion. Also, there were other well-known African music names on the nominees list including; Mafikizolo (South Africa) with 6 nominations, Davido (Nigeria) also with 6 nominations, Diamond Platnumz (Tanzania) 2 nominations, Amr Diab (Egypt) 2 nominations, Zahara (South Africa) 3 nominations, Angelique Kidjo (Benin Republic) 2 nominations, Fally Ipupa (DRC) 1 nomination, Sakordie (Ghana) 1 nomination, Tiwa Savage (Nigeria) 2 nominations, Uhuru (South Africa) 5 nominations and Mi Casa (South Africa) 4 nominations. Leading the budding music acts on AFRIMA Nominees’ List is: TemiDollFace (Nigeria) 4 nominations, others are Wiyaala (Ghana) 3 nominations; Patoranking (Nigeria) 2 nominations; Davina Green (Zimbabwe) 1 nomination and Noura Mint Seymale (Mauritania) 2 nominations, etc. Angélique Kpasseloko Hinto Hounsinou Kandjo Manta Zogbin Kidjo, known as Angélique Kidjo, is a Grammy Award–winning singer-songwriter and activist from Benin, noted for her diverse musical influences and style. She was born into a musical family and at an early age of 6, was already performing with her mother’s theatre crew.